PEBKAC for sure, but a potentially dangerous design flaw too? No video of the main event. This is unacceptable. Dave should have cameras on 365/7/24. The higher voltage will drive the transformer core into saturation. This will increase the current on the primary side quite a lot. So burning the primary is about normal. I am kind if surprised that the secondary fuse blew. Normally I would have expected a thermal fuse at the primary. So the transformer would be still broken, but less smoke and fire danger. IIANM, as soon as the core saturates the flux won't increase anymore and the secondary voltage won't increase anymore either, but, the primary current would increase like crazy because in saturation it (the primary) becomes a short circuit. That, plus some design headroom in VINmax in the PCB circuit is what saved it, I would say. And if you've got 50Hz there, it aggravates the situattion because that transformer is a 60Hz one. I think you should now make an educational video about the magnetic core saturation. And then, at the end, explain how this led to the isolation meltdown in this transformer. You have all necessary lab equipment to demonstrate this effect. Without a smoke of course, but showing that the AC current goes through the roof when the core saturates. This Weller is UL approved and UL61010-1 is the related standard. But anyway all country use standard with similar content just different title. current being drawn from the MAINS in case of a fault in the equipment. compatible with the current RATING of the installation. side of the overcurrent protection device. circuit-breakers shall not be fitted in the neutral conductor of multi-phase equipment. interference suppression components to be located between the MAINS supply and the overcurrent protection devices. But I think the circuit breaker of house is enough. Like in the NOTE1 "Overcurrent protection devices supplied with the equipment are intended..." so it suppose the overcurrent protection doesn't has to be built in the device. I'm not sure why European designs have no fuse on transformer primaries. I see primary fusing as a regulatory requirement in North American products, OR a (primary) thermal fuse at the least. Sometimes the primary wire ends up being the fuse which melts. The complete absence of any kind of protection on the primary side is mind-boggling. They assumed that only the circuit powered by the secondary side could become faulty. I guess they may have gotten away with it by stating both on the underside label and in the user's manual that it's a 120V device only, so it was probably never tested in lab with any higher mains voltage. This could seem sort of acceptable, but it would assume that the transformer itself can't fail if powered correctly, or the associated wiring to the mains plug, which is more wishful thinking than realistic. Also, as there is no protection whatsoever on the primary side (no fuse, no MOV, no nothing), any overvoltage on the mains line could potentially fry the transformer. Short of very cheap/fake equipment, I think this is the first time I get to see something like this. 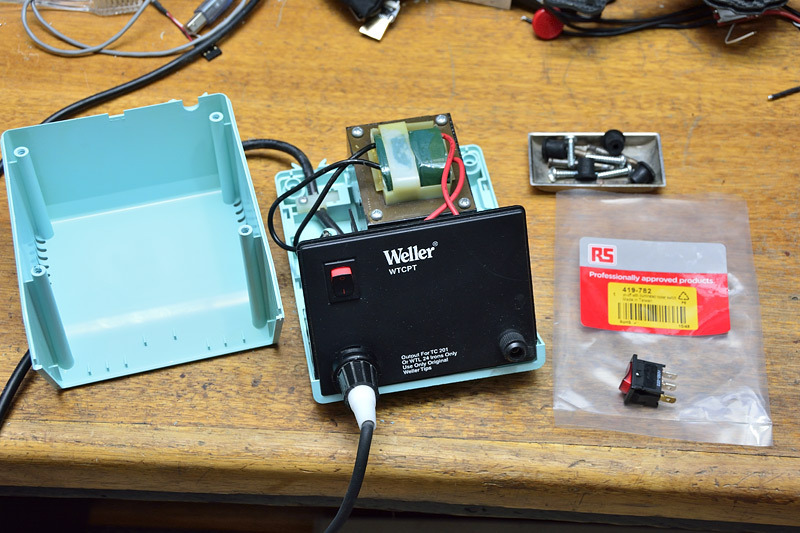 All my soldering stations have fuses on the primary side, from cheap Atten stuff to the relatively high-end ERSA ones. Classic core saturation as many have said already, and they might be able to blame the user if they apply double the voltage to to the product. But a similar effect could be caused by a short in a single turn of the primary or the secondary, this could easily happen during manufacturing if the enamel is scratched or someone jams a tool into the winding during installation. So no fuse on the primary is a serious fire risk in transformers. Whenever I see a bodge (barnacle) consisting of a hand-soldered fuse in series with a polyfuse, you know they had problems. That is plain silly, only dumbasses do that. All I see is IEC 60335-2-45 clause 17 is about transformer protection but I don't have that doc. The transformer does not output 2X Vprimary due to saturation, which is why the primary burned up. WE 1010NA Hmm they have $20 rebate offer for it. For example Metcal uses SMPS for their RF heating system, so it has universal input. +1 Thanks, I can sleep now knowing it has UL approvals to probably UL 60335-2-45. The WE1010NA is North American version. So is it the safety standard that let the house burn down? No primary fuse is a no-no. "Appliances incorporating circuits supplied from a transformer shall be constructed so that in the event of short circuits which are likely to occur in normal use, excessive temperatures do not occur in the transformer or in the circuits associated with the transformer. NOTE Examples are the short-circuiting of bare or inadequately insulated conductors of accessible circuits operating at safety extra-low voltage. Compliance is checked by applying the most unfavourable short circuit or overload which is likely to occur in normal use, the appliance being supplied with 1,06 times or 0,94 times rated voltage, whichever is the more unfavourable". Some of the old Wellers did come with removable fuses. the tip, is there anything else I need to do? Am I screwed? I can't see it clearly but is that a fuse cover on the bottom right? It looks like they are cutting corners of safety. Take the transformer outside and connect 240V to it (with a heater or something in series to prevent the fuse blowing), then see if it actually catches fire. On a product that costs this much seems a bit silly not to include some protection for this sort of thing. Just off the top of my had, could have something as simple as a diode for half wave rectification, a high voltage ldo like LR8K4-G to get 12v/24v or something that would power a comparator or something which measures input voltage and turns on a relay/triac/whatever if mains voltage is less than 140v. I have a lot of mixed voltage gear, quite a bit of it from the US (120V Weller stations) with 240V Weller stations on the same bench. I keep the US IEC mains lead always connected to the US to prevent this kind of mistake. I checked the datasheet for the Weller WE1010 and it is supposed to conform to EN 60335-1: 2012-10.
but the changes should only be minor. Electronic circuits need to be designed and operated in a way, that a single failure of the device doesn't make it unsafe in terms of electric shock, fire hazard, machanical hazard or dangerous malfunction. Note 2: Fuses, temperature cutoffs, overcurrent-limiter or equivalent may be used to provide this safety. The safety mechanisms of building installation do not provide the required safety. So in my opinion this seems illegal, at least according to EU regulation. It may as well be, that it is allowed in the US and they have a built in fuse for EU units. I still have a lot of 120V only gear in the lab and a big transformer to supply it all. To prevent this from happening, each instrument got a big yellow sticker on top "120V only!" on the primary. I am producing test stands myself and they have to have a primary protection. IMHO its a flaw in the IEC60320 connector standard that it doesn't include ridge/groove keying to discriminate between 120V and 240V/universal voltage applications. The standard does discriminate between C14 cold condition inlets and C16 hot condition inlets so a C15 cold condition cord cant mate with a C16 hot condition inlet, but a C17 hot condition cord can mate with either, so if the initial standards committee had been a bit less US centric, they might have done the sensible thing. However 50 years later, that's what we are stuck with. Weller not fusing the primary is unforgivable, as even in the target market 240V circuits are common and if miswired there is a risk of 240V appearing on an ordinary 120V 20A duplex outlet. I wouldn't expect a replaceable fuse, but they were penny pinching in the extreme not to include a thermal fuse in the primary. That goes against all safety standards, violates 61010, and common sense standards too. Even a Yihua 858 has input fuses, as anything mains connected be it smps or linear transformer must have, and this is not about single or double isolation for operator safety, but for fire safety. then re pack the transformer E-pack with some bolts to hold it together. use the same AWG wire size as the old. IMO! add a primary fuse.